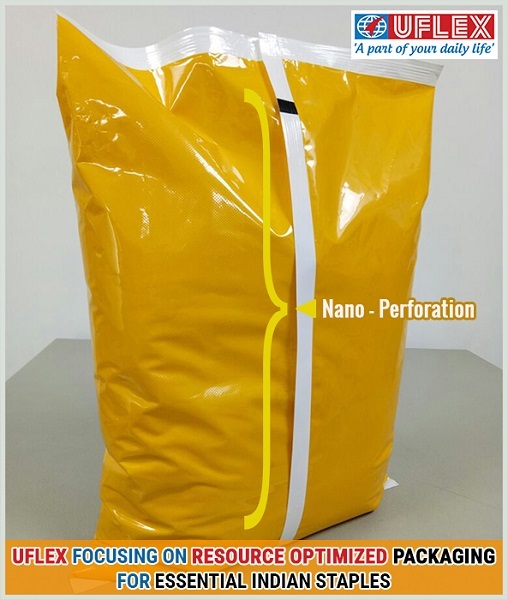 India’s largest multinational flexible packaging materials and Solution Company Uflex in an endeavour to extend the very use of flexible packaging is particularly paying a lot of emphasis on developing resource optimized packaging for essential staples like Pulses, Wheat Flour, Sugar, Salt and Oil. Talking more about this initiative, Mr. Jeevaraj Pillai, Joint President, Packaging and New Product Development, Uflex Limited pointed out, “Flexible Packaging sector in India will get the real boost when high volume (bulk) commodity food items like Pulses, Wheat-Flour, Sugar, Salt and Oil are marketed in packaged form. In India, almost 80-85% of unbranded food products are still sold loose without pre-designated packaging. With steadily increasing demand from urban consumers for branded high volume commodity food items, we are now getting a lot of enquiries from popular food brands for developing cost-effective packaging particularly for the essential staples category. We have recently developed a 2 ply laminated packaging for wheat flour comprising a specialised Polyester(PET)/ specialised Polyethylene (PE) structure. Two rather dichotomous situations had to be addressed in manufacturing this packaging solution for Wheat-Flour (in the 5 Kg Segment). In order to restrict the pricing within 2.5-3% of the total MRP of the 5 kg Wheat Flour Pack, we had to optimally downgauge the packaging. Downgauging cannot come at the cost of functionalities and strength of the pack. Therefore to ensure that the wheat-flour packaging is sturdy enough with good mechanical properties to withstand the weight of the product being packed as well as to sustain the rough supply chain conditions, we adopted a three-pronged approach. We modified both the Polyester Film and the Sealant PE Layer to optimize the overall characteristics of the packaging. Both the layers were rendered special high dart impact resistant to pass 5 drops from 1.2 m height as per the ASTM standards. We were able to reduce the thickness of the PE by almost 38% which substantively downgauged the overall packaging. This reduction makes the packaging light-weight/resource optimized and far more sustainable than its erstwhile version.